The Dallas-Fort Worth Metroplex is a fantastic place to live because it has so much to offer the people who live here. Rooted in a strong traditional culture and emerging onto the national radar as one of the USA’s largest, most bustling urban areas, DFW offers its residents the best of the modern world as well as cultural treats unique to Texas. This also means that when it comes to furnishing or decorating your Dallas or Fort Worth home, you have a lot of options. This is a big city, after all, and it sprawls for miles and miles. Of course, bigger is better in Texas, but it can still be tricky knowing all of what’s out there, or even where to start when it comes to looking up stores online. So, we thought we’d try and help you out by putting together a map of all the custom furniture and other home decor options near you in the Dallas-Fort Worth area. Whether you’re new to the area, or live in the house your great-grandparents built, this map may help you find a store you’ve never come across before—and that has exactly what you were looking for. As you’ve probably noticed from the map—or just from living in DFW—many of the best home decor and furniture options are clustered near each other in several different shopping districts. The most prominent, of course, is in and near downtown Dallas, particularly in the Design District. In addition, Addison’s great for rugs and home decor, Grapevine is home to many different home decor stores, and Arlington and Fort Worth each have their share of solid decorating options. Having so many great options means that you can easily make a fun day of shopping for your home. When you are tackling a new home design project, it helps to be strategic about it. If you are redoing an entire room, the first thing to do is settle on your flooring and wall treatments. From there, you will want to begin your search for the most foundational items of the room—the furniture. Once you know which dining table or desk is going to be the centerpiece of the room, you can move on to the other aspects of home decor that will make the space uniquely yours, from the perfect set of dishes for your new hutch or a funky new vase to stand proudly on your end table. A fun way to tackle a design project is to make a full day of it. 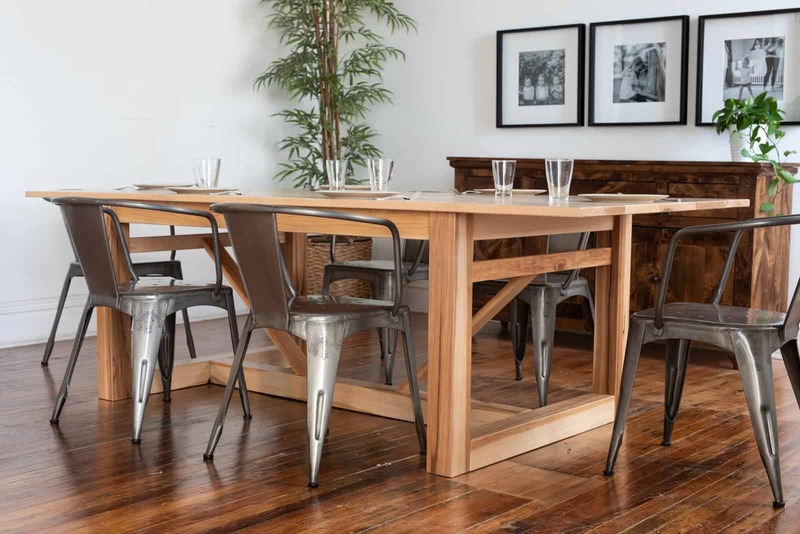 For instance, if you schedule a Saturday morning trip to a furniture showroom in Deep Ellum, you can start your day with a coffee and an interesting book from Deep Vellum, then order a beautiful new dining room table sized and customized to your tastes by lunch. You can grab a bite to eat at one of Deep Ellum’s many delicious restaurants, then head over to the Design District to stroll around until you find the perfect rug to sit beneath your new table. Once you’ve found just the right one, it’s only a short walk over to a lighting gallery, where you can find some unique fixtures to complement your new table and floor covering. As the day winds down, you can pat yourself on the back with a tasty craft brew from Peticolas, just steps away. If you’ve found everything you were looking for, you can bask in a job well done. Or, if there’s another item or two left on your list, you can try it again next weekend in Grapevine! To ensure the quality of our furniture, we hand-pick every board, build your piece from the solid hardwood, and meticulously sand down and finish the wood to show off the beautiful natural texture of the grain. And we guarantee it for life. DFW is booming these days, and the options for creating beautiful spaces in your home are endless. Starting with a stunning piece of custom, handcrafted furniture can inspire the rest of the room, and a fun and well-planned day’s outing to local shops can help you finish it. At Unruh Furniture, we take pride in building beautiful custom furniture for our Dallas-Fort Worth customers. To find the perfect dining room, living room, bedroom, or home office furniture, schedule a visit to our Dallas showroom today. Image 1: After customizing your dream dining room table in the morning, you can spend the afternoon in the Design District finding the perfect home decor to go with it!